Simply put, the greatest joys I encounter in life are discovered through outdoor adventures and the the human bonds that come from them. Surrounding myself with a community of balanced minds and creative individuals has led me to more unbelievable friendships and experiences than I could ever imagine. These moments often defy my immediate comprehension and require time to truly process. The act of exploring space with my body and canopy is a good example of what I’m attempting to explain. My brain tells me I can’t fly, yet man has found a way to do it. My instincts tell me I can’t walk in space, yet we’ve also found a way to do this too. It takes a bit of reprogramming to wrap my head around the realities we’re all capable of accomplishing and I try my best to strike a balance between this understanding and natures laws against them. The past two film shoots I’ve been a part of, along with fellow Moab Monkey teammates (Scott Rogers, Lauren Crepeau and Daniel Moore), have been a great example of the unique passion we all share between gravity and heights. 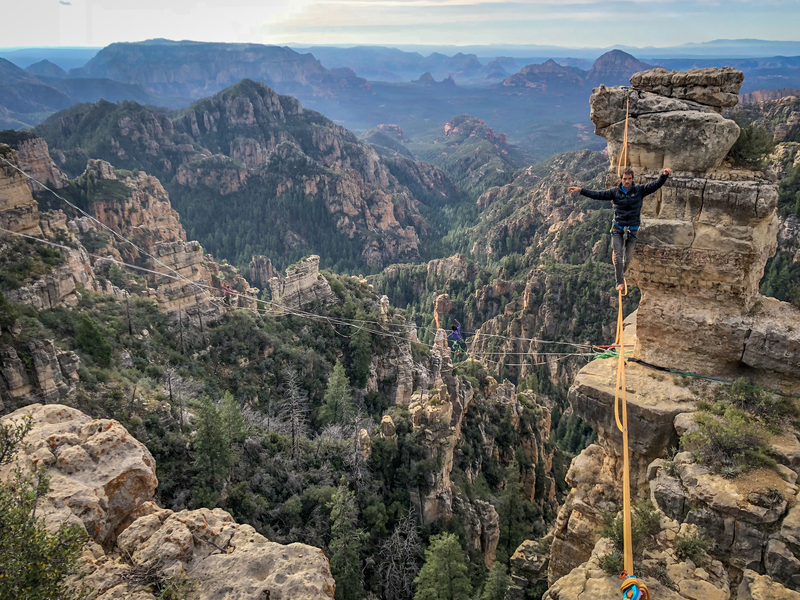 As seen through the cinematic eyes of Devin Graham and Parker Walbeck, in collaboration with Ford’s new car campaign #onetankadventure, the unique visuals of BASE jumping and highlining are now accessible to a larger audience. Even if only through the looking glass of a computer screen or television, I hope our hard work and years of training will shine through to redefine the changing limits of human capabilities. The mental obstacles we often construct for ourselves, usually out of fear of the unknown, prove shortsighted from our actual potentials. It just takes a little discipline, training and determination to see what lies beyond the norms to rediscover a little adventure in our lives. As Helen Keller once said, “life is a daring adventure or nothing at all.” So get out there, enjoy life to the fullest, explore your wild nature and find fun ways to share your living experiences with those you love.